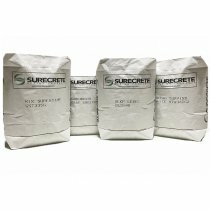 Cost effective resurfacing material for damaged concrete slab that desperate need of repair and resurfacing or you are simply looking for a new and fresh look for your walls or floors, pre-blended overlay bag mixes provide the application flexibility and widest variety of design. Overlay mixes asy-to-use, just-add-water mix designs, we’ll enable you to create your ultimate masterpiece or just give you a nice, clean surface for your project. Incredible self-bonding strength to the concrete surface. Available in ultra-thin and with a particular aggregate, cement based coating to resurface both interior rooms and exterior concrete surfaces. It can be troweled, sprayed, and squeegeed. Used with tape and stencil patterns.